From the removal of Confederate monuments in New Orleans in the spring of 2017 to the violent aftermath of the white nationalist march on the Robert E. Lee monument in Charlottesville later that summer, debates and conflicts over the memorialization of Confederate "heroes" have stormed to the forefront of popular American political and cultural discourse. In Written in Stone Sanford Levinson considers the tangled responses to controversial monuments and commemorations while examining how those with political power configure public spaces in ways that shape public memory and politics. 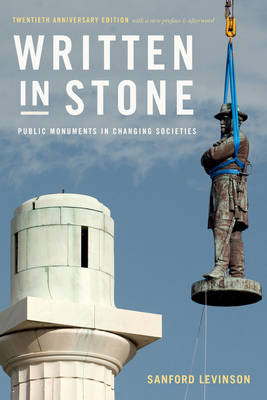 Paying particular attention to the American South, though drawing examples as well from elsewhere in the United States and throughout the world, Levinson shows how the social and legal arguments regarding the display, construction, modification, and destruction of public monuments mark the seemingly endless confrontation over the symbolism attached to public space.